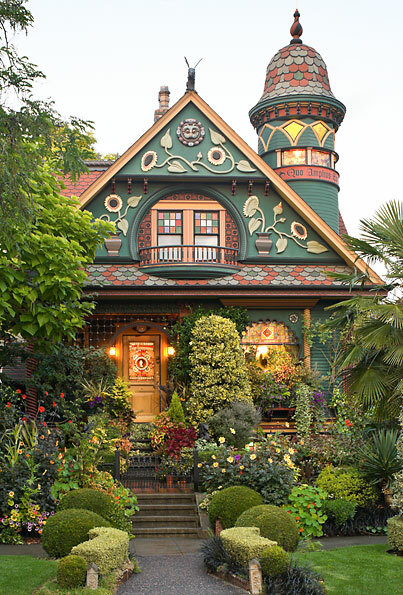 Psychiatrist and author Brian Coleman spent 20 years turning a 1906 cottage in Seattle’s Queen Anne neighborhood into a magical Victorian home. Now Historic Seattle is offering registered participants the opportunity to take a tour. The Latin inscription on the home’s bell-topped turret says it all: “more is better.” Wrought iron gates, exotic plants, decorative shingles and hand-carved sea serpents are just a few of the over-the-top exterior features of this distinct property. Coleman is a practicing psychiatrist in Seattle who has turned his love of old houses into a second career as the author of 14 books and numerous articles on the decorative arts. The storybook cottage was his passion project and an escape from the emotionally draining world of caring for the mentally ill. The tour of Coleman’s home is scheduled for July 17th from 1pm to 4pm, and tickets are already sold out. Hopefully interest in the project will prompt Historic Seattle to host an encore event.